I found this adorable pink chair the other day at Goodwill for $8. I loved the lines and it’s the perfect size for a spot in the corner of my family room. However, I did not like the color. 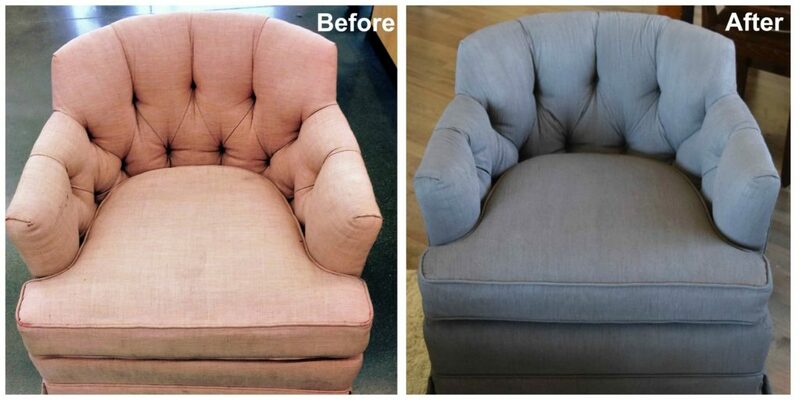 As a total Pinterest-junkie, I’ve read a few articles on how to repaint upholstery. I have really wanted to try it but every pin was different. It seemed the number one concern was keeping the fabric soft. I thought I would avoid that by using a fabric spray paint, but I couldn’t find it in the right color. 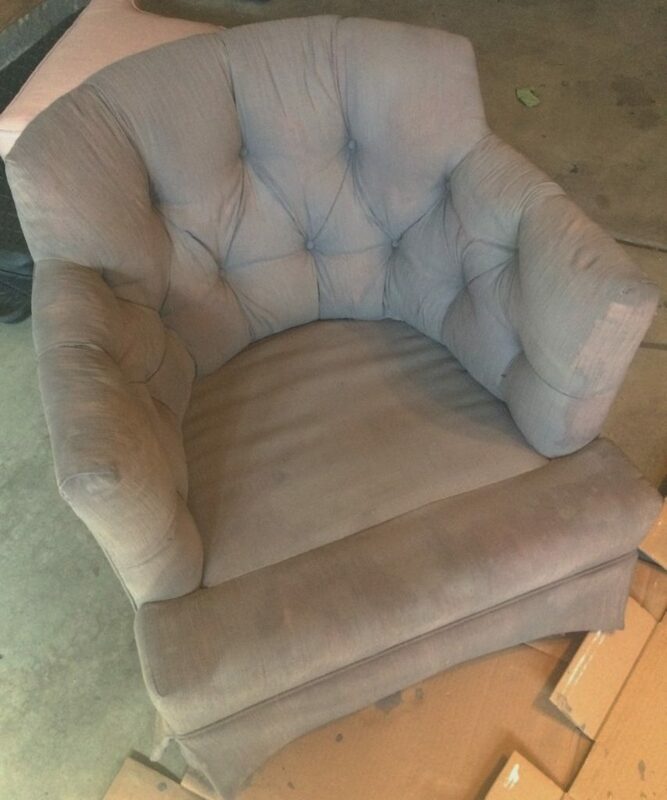 I started researching using regular latex paint on upholstery so I could have the exact color I wanted. There were several “recipes” so I created a hybrid of what I thought would keep the fabric the softest. The key to keeping the paint and fabric from getting stiff is textile medium. 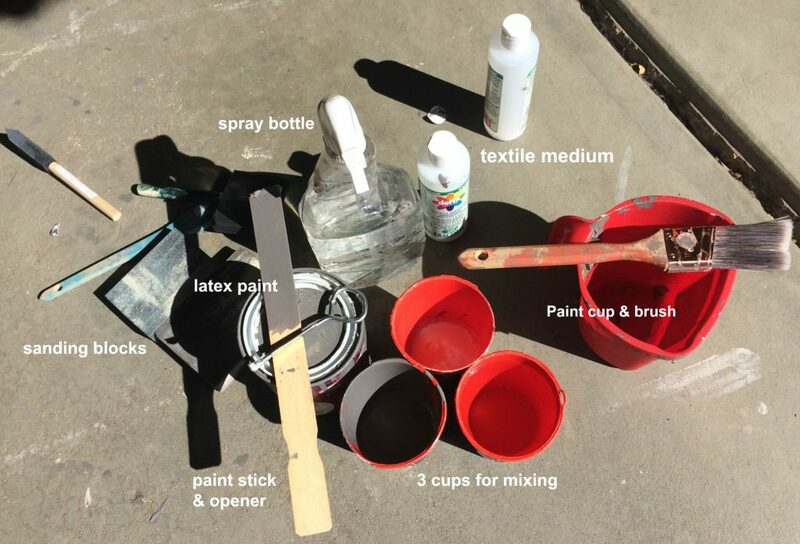 Here’s what you’ll need: a spray bottle, three cups for mixing, water, latex paint, textile medium, a paint brush, a cup for mixing paint, a stir stick and a paint can opener. First of all, make sure the chair is clean. Once I got mine home and took a closer look, I’m pretty sure it came from a cat lady’s house. All those little tufts were filled with fur, so was the quite a chore for me and my vacuum attachments. Take the three cups and put evenly in each one water, paint and textile medium. I filled them each only 1″ and then poured them into my painting cup. Make sure you stir it well. It will be a thinner consistency than paint but still have the same color. Next, use the spray bottle (filled with water) to wet the fabric. No matter how much you spray it will bead and run off unless you use your hand to rub in the water. I suggest doing it in small sections and then painting. When you paint, always work from the top down. You will get messy…so wear old clothes, take off your rings and put cardboard under the chair. Starting out I did a good job of wetter in the fabric and then painting. The color is going on consistently. 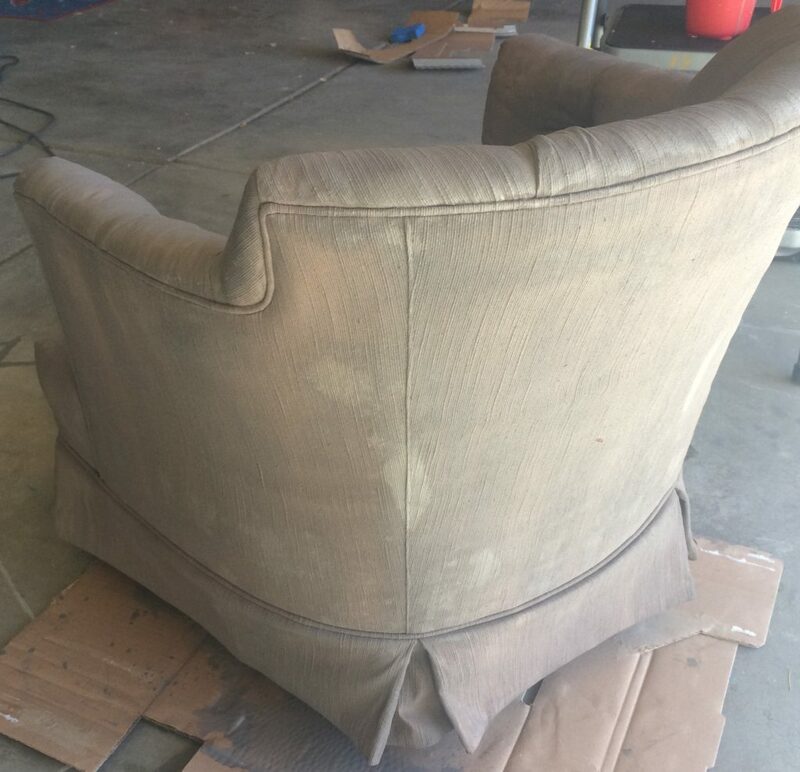 I used a paint brush to apply it which worked well to help show the texture of the upholstery. At this point I was also out of my first batch of the paint/water/textile medium. Once mixing up more, I started to work on the tufts of the seat’s back. Again, I used the brush to get into the button areas. To make sure none of the pink was showing later I pulled, unfolded and/or stretched all of the creases to get the paint over the pink. Yes, my hands were totally gray. I waited six hours for it to dry before doing the second coat. I was much more careful about wetting the fabric first, but it seemed to be an uphill battle against the paint that was already on. The following morning I decided it needed one last layer of paint to camouflage the last of the pink. Once I was done I realized that my friends who’d done this before were right – the fabric is still really stiff. Yes, the textile medium and water helped immensely. 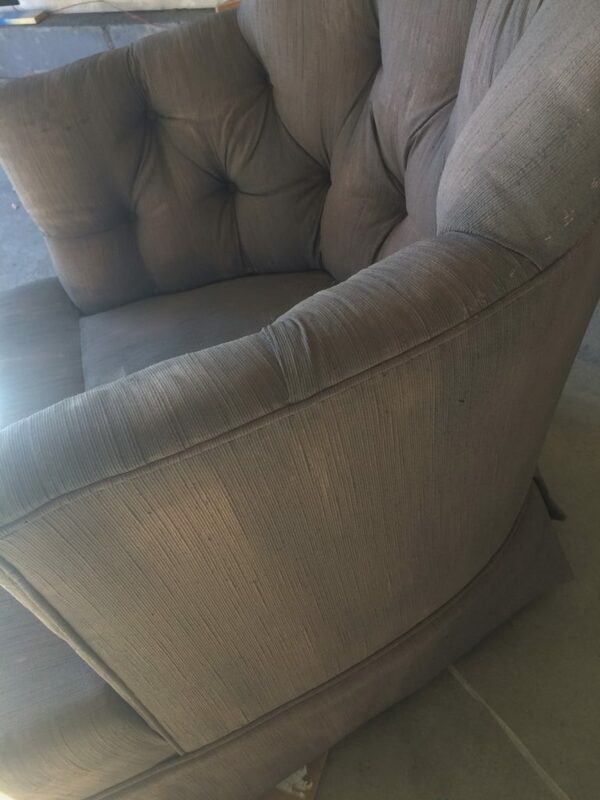 It didn’t feel like outdoor fabric or that it would crack when sat on. However, it wasn’t as soft as regular upholstery. I’d read somewhere that using very fine sandpaper (or a sanding block) would help…and it did a little bit. Maybe if I had done it between paint layers it would have stayed softer. Oh well, a lesson for next time! All in all, I don’t think it turned out too bad. Most importantly, it fit the criteria for this spot – more seating for our family room, something small to squeeze between the family and dining areas and to help define the two areas. I mean, I love an open floor plan but jeez it’s hard to work with sometimes! 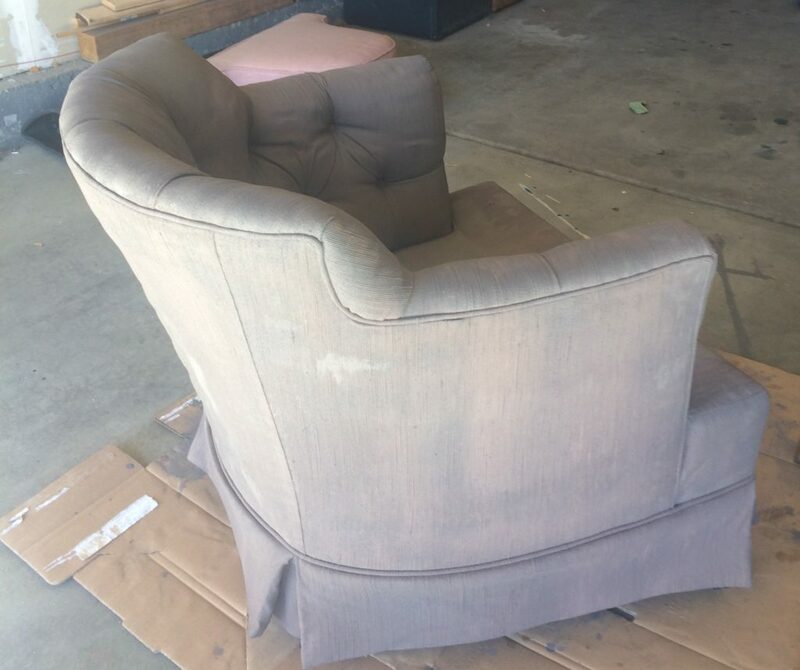 True to it’s time period, this sweet 1970s chair is on wheels. 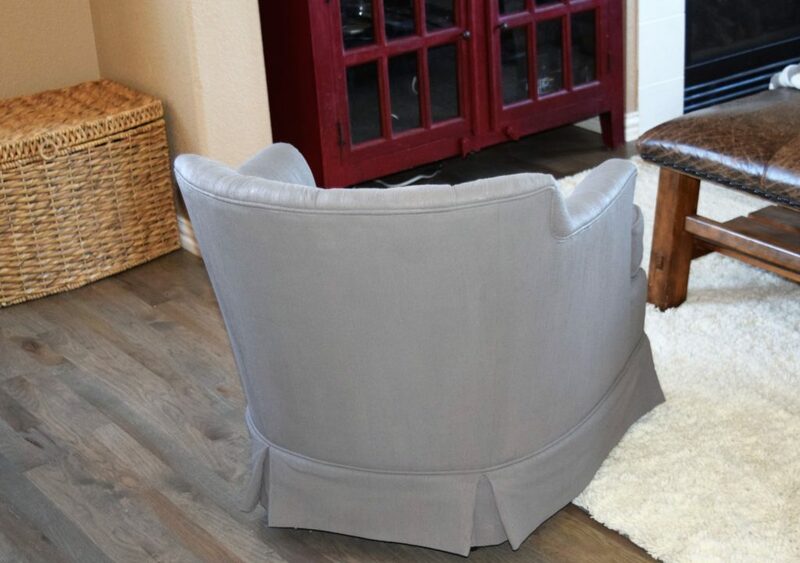 I love that this chair can scoot to accommodate whatever we need for the space. Bottom line: I definitely would do this again, but maybe not for a chair we plan to use regularly. Once I can find a better piece, this will mostly likely end up in a corner of a bedroom. 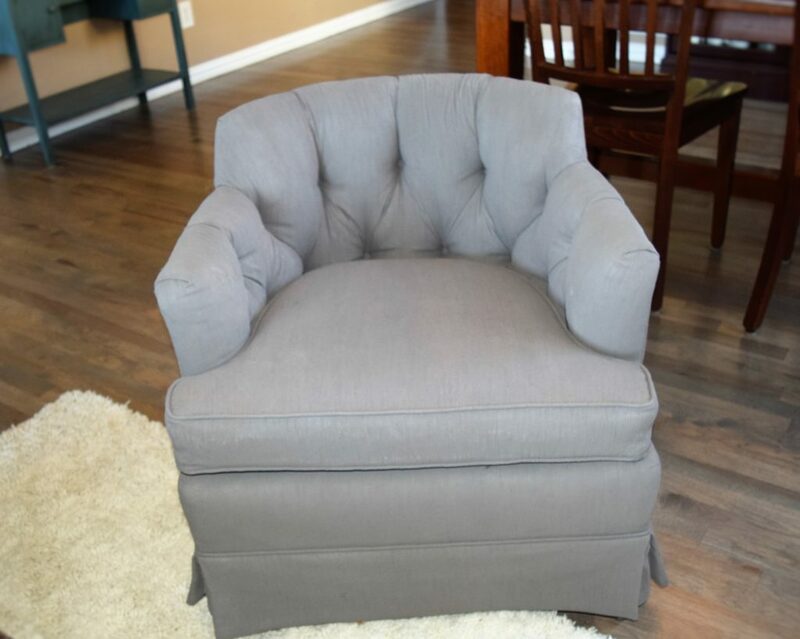 It’s cute to look at, but not the softest to sit in! 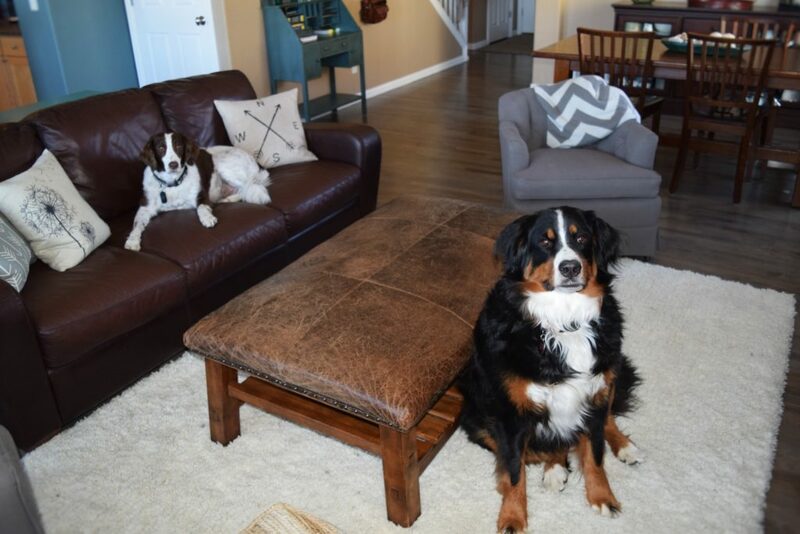 PS – Say hello to my canine assistants, Jasper and Lola. They were a little too helpful the day I was trying to take photos. It looks good! And I know from experience that doing those projects are cathartic – even if you only ever do them once. 🙂 Also, I love your upholstered leather coffee table! Thanks! 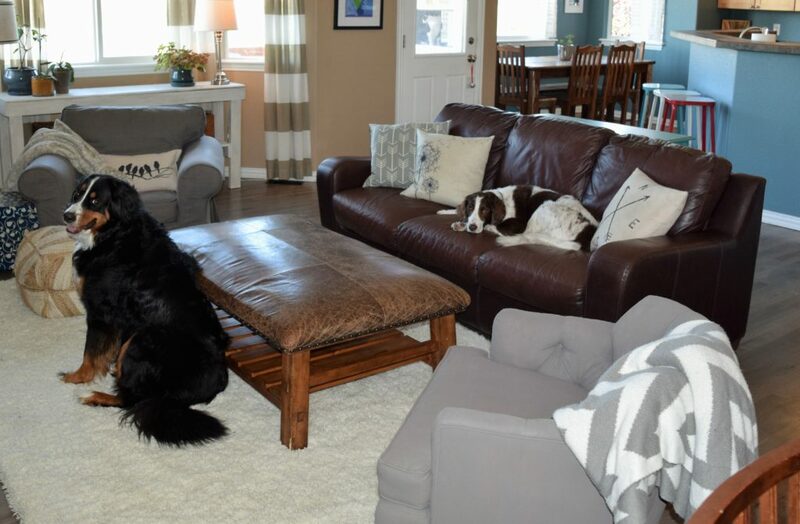 We got it a few years ago from Pottery Barn.